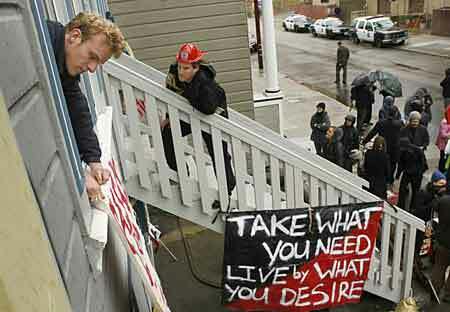 A group of homeless people and housing activists took over a privately owned Mission District duplex on Sunday in what served as the climax of a protest designed to promote use of San Francisco's vacant buildings as shelters for the needy. But the owner of the property - who was targeted over his eviction of a tenant - said the demonstration was nothing more than breaking and entering. "It's not actually vacant. I use it for my own personal uses," Ara Tehlirian of Daly City said in an interview, adding that he was in contact with the San Francisco Police Department. "I know nothing other than my property was apparently broken into." Hey, just because someone else worked, earned the money, bought the property and is trying to sell it is no reason why a bunch of grubby freeloaders should not show up to demand their handouts. I think the harshest buzz to hit hippies and socialists is the simple fact that being stoned, exuding peace and love and "just trying to get by, man" does not guarantee that "mother earth" or "karma" will take care of all of your needs. Try washing, shaving, getting a hair cut, learning some skills then actually get a job that pays cash. The rest of us do this; you can as well. This page contains a single entry by DaveH published on April 5, 2010 6:59 PM. The Progressive X-Prize was the previous entry in this blog. A big dose of reality over at Mostly Cajun's place is the next entry in this blog.